Dragon arrives at the crime scene in DeKalb, Illinois after he was specifically called in due to the nature of what was found in the basement. He enters the room and finds a super-freak girl chained up in front of a television. The girl was barely clinging to life due to starvation and dehydration so Dragon breaks her free and takes her to receive medical attention. Frank Darling receives disturbing news about his wife and heads to a hospital where she is being treated. When he arrives, Mildred Darling reveals that she was knocked over by accident on an escalator and fell, breaking her leg. Their unborn child is fine so she writes off the event as a simple event, unaware that Franks suspects that the Vicious Circle are responsible and this was merely a warning to him to follow their directives. The freak girl has been given the codename of Horridus and Captain Stewart hopes to recruit her to join a new team he’s putting together that will operate out of the Chicago Police Department. Amanda Mills stops by the precinct to visit Dragon and once more tries to get him to agree to a date. Dragon rejects the proposal, pointing out that he has too many enemies and does not want another girlfriend to be killed, especially when he went through a great deal of trouble to rescue Amanda in the first place. Captain Stewart speaks with Dragon and Dart, announcing that Horridus is already going through the police academy. He would like to expand the team and thinks that Star and Mighty Man would be perfect candidates. Dragon suggests that Barbaric and Ricochet would be good recruits just as Phil Dirt announces that trouble in the underground has broken out involving super-freaks. 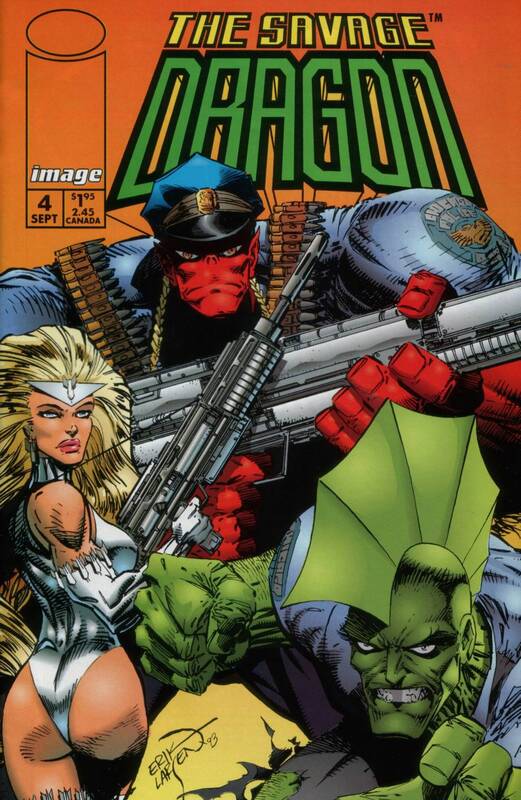 Dragon and Dart quickly travel to the underground where they find Ricochet in the grips of a villain known as CessPool. Barbaric is desperately trying to get CessPool to release his hold on his girlfriend but to no avail. He gets cast aside before Dragon is shot by CessPool’s burning puss leaving it to Dart to save the day. She impales CessPool with numerous darts which eventually causes enough pressure to be released and he explodes, the entire gathered up puss within him bursts outward. The two teenaged heroes are offered a position on the police force. Ricochet believes that being part of the authorities is the best way for her and Barbaric to avoid a life on the run and in hiding. NOTE: The “Savage Dragon Vol. 2: A Force to be Reckoned With” trade paperback collection adds in a two-page prologue of Dragon and the cop cars arriving at the Hills’ house.